Fiber optic cable is considered as one of the most effective transmission medium today for safe, and long-reach communications, and it also offers a number of advantages over copper. In general, fiber optic cable consists of a core, cladding, coating, strengthening fibers, and a cable jacket, which has been clearly introduced in the previous article. Today’s article will focus on the several materials in fiber optic cable construction, as well as their features and applications. Polyvinyl Chloride (PVC) is one of the most commonly used thermoplastic polymers in the world. The PVC cable is typically used for patch connections in the data center, wiring closet, and at the desktop. PVC is produced in two general forms, first as a rigid or unplasticized polymer (RPVC or uPVC). The following image shows a ST single-mode pre-Terminated cable (0.9mm PVC Jacket). Good resistance to environmental effects. Some formulations are rated for -55 to +55. Good flame retardant properties. 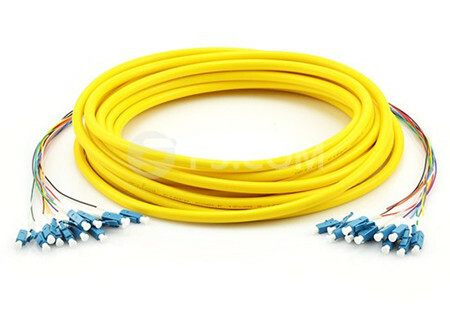 Can be used for both outdoor and indoor fiber optic cables. PVC is less flexible than PE (Polyethylene). Polyethylene is a kind of polymer that commonly categorized into one of several major compounds of which the most common include LDPE, LLDPE, HDPE, and Ultrahigh Molecular Weight Polypropylene. Polyethylene fiber has a round cross section and has a smooth surface. Fibers made from low molecular weight polyethylene have a grease like handle. If treated with proper chemicals, PE can be flame retardant. The word Aramid is a generic term for a manufactured fiber in which the fiber forming substance is a long chain synthetic polyamide in which at least 85% of the amide linkages are attached directly to the two aromatic rings as defined by the U.S. federal trade commission. Kevlar fiber is based on poly (P-phenylene terephthalamide). Aramid yarn is the yellow fiber type material found inside cable jacket surrounding the fibers. It can also be used as central strength members. Aramid yarn is very strong and is used in bundle to protect the fibers. Kevlar is a brand of aramid yarn. Kevlar is often used as the central strength member on fiber cables which must withstand high pulling tension during installation. When Kevlar is placed surrounding the entire cable interior, it provides additional protection for the fibers from the environment. The steel armored fiber cable, using light-steel tube, can provide maximum bend radius, strong protection and flexible cabling. Steel armor jacket is often used on direct burial outdoor cables and it provides excellent crush resistance and is truly rodent-proof. Since steel is a conductor, steel armored cables have to be properly grounded and loss fiber optic cable’s dielectric advantage. Armored fiber optic cable are often used in the outdoor direct burial cables and for the industrial environment where cables are installed without conduits or cable tray protection. The following image shows a single-mode armored fiber optic cable. Various types of these light-steel armored fiber cables are in stock in FS.COM, including pre-terminated armored fiber patch cables, armored fiber trunk cables and field-terminated armored fiber cables for both indoor and outdoor applications. Strength member is used to increase the tensile force that will be applied on the cable during installation. Strength member will take the pulling force and will keep the fibers safe during installation. For large fiber count cables, a central strength member is often used. The central strength member provides strength and support to the cable. During fiber optic cable installation, pulling eyes should always be attached to the central strength member and never to the fibers. On fiber splice enclosure and patch panel installations, the cable central strength member should be attached to the strength member anchor on the enclosure or patch panel. When you choose to use which type of the fiber optic cables, the fiber optic cable construction, along with the mechanical and environment requirements should all be taken into account. All the above materials in the fiber optic cable construction are specifically required to meet the network infrastructure. FS.COM fiber optic cables come in various types with detailed specifications displayed for your convenient. These quality cables are designed with best-in-class performance. 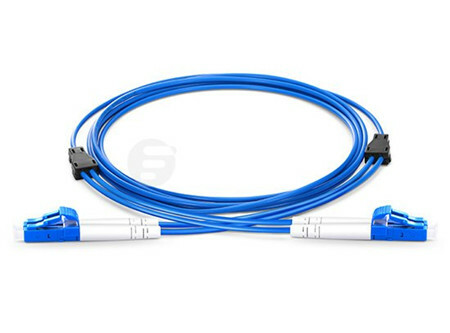 For more information about fiber optic cables or patch cords, you can visit fs.com.